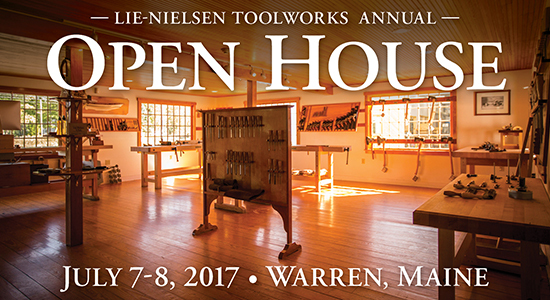 We are excited to be attending this year’s edition of the Lie-Nielsen Open House. The annual event never disappoints, with a great group of hand tool event staff showing off the latest additions to the Lie-Nielsen line. There will also be a diverse group of guest demonstrators present, showing off their wares and creations. And don’t forget to enter the Open House raffle for a chance to win one of three great prizes: a bevel edge chisel, a 102 low angle block plane or a honing guide. The Saturday night lobster bake dinner may be sold out, but the rest of the open house is still well worth a visit. See you in Maine! Sigh. I will be visiting Lie Nielsen but it will be on the Monday 03 July (I didn’t want to disrupt my wife’s first vacation on the east coast with my plans and she was exciteid and set us up elsewhere during the open house). Do you happen to know if there will be anything special that early in the week?